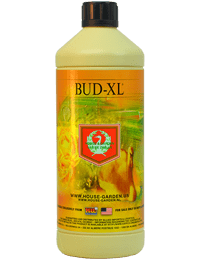 Bud-XL is a late bloom flower enhancer that helps to extract sugars from bracts and transports them into the fruit for bigger and sweeter yields. All ingredients and additives are made with pharmaceutical and/ or food grade ingredients in small batches to ensure a consistent quality and experience. Mix 1 ml Bud-XL to 1 liter of nutrient solution. Use from the start of week 6 to the end of the rearing cycle.